Thinking of the lowliness of his heart, AzhwAr moved away from emperumAn in the previous pAsuram. In this pAsuram, he tells his heart “If we think of your lowly activities, it is proper that we move away from emperumAn. But if we think of emperumAn’s activities, we can approach him”. nenjE edhiridhA pArththu Or – Oh heart! Analyse this at the very beginning, seeing it directly. But, what is to be analysed? 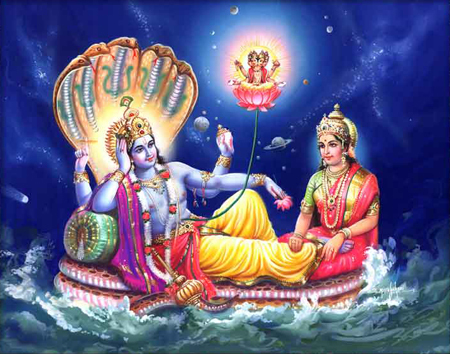 Arththu Odham tham mEni thAL thadava thAm kidandhu thammudaiya semmEnik kaN vaLarvAr sIr padu thuyaram pErththOdha pIdazhivAm pEchchillai – emperumAn is lying in the roaring ocean which is gently rubbing against his divine form and divine feet. He is in yOganidhrA posture (wherein the body if fully relaxed and the mind is fully alert). If we forget our sorrows and think of his auspicious qualities, there is no possibility that such thinking will lead to destruction of his greatness. The word semmEnikkaN would refer to reddish coloured eyes. For the words tham mEnith thAL, periyavAchchAn piLLai, the commentator for this prabandham, considers the meaning as ‘his reddish divine feet’. We will take up the 16th pAsuram next. This entry was posted in iyaRpA, periya thiruvandhAdhi on October 21, 2018 by T N Krishnan.